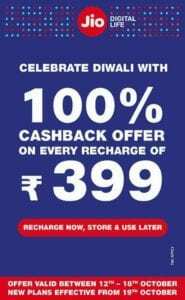 Jio Phonepe Diwali Dhamaka:-Hello Guys, I Hop You looted a lot of deals during This Diwali Sales On Amazon And Flipkart here we are Back with a New Offer for You.Jio Recently Announced that Prices of Jio Plans Will Change from 18OCT.You can Get the Same Package at Rs.399 till 18th Oct Later You have to Pay According to New Plans. 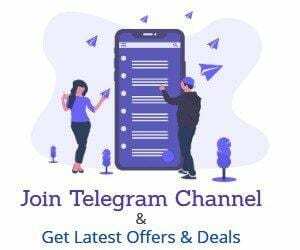 Jio Is running an Offer with its Partner Recharge Sites Like Phonepe, AmazonPay, and Others, You Will Get Rs.399 Cashback On Recharge Of Rs.399+Rs.101 cashback on First Jio Recharge Of Rs.399.You can Combine both offer to get a complete Rs.500 Cashback On Your Jio Recharge So Guys If You haven’t recharge with Phonepe Or Amazon Pay Go ahead and recharge Your Jio Number to Get a Total Rs.500 cashback On Rs.399. 100% Cashback Of Rs.399 will be Given in Form of Vouchers, You will Get total 8 Vouchers of Rs.50.You can Use this Voucher for Your next Jio Recharge.Read Terms and Conditions For More details. 2.Now initiate a Recharge Of Rs.399 For Your Jio Number, It Must be Your First Recharge. 3.Now Pay the Amount and Complete Your Transaction using UPI. 4.When Your Transaction is Completed Instantly You will get Rs.101 In Phonepe Wallet. 5.The Voucher will be sent to you in MyJio App that will be applicable on next recharges. If the offer overlaps with other existing offers, the maximum of the offers is applicable. If you have exceeded the monthly wallet transaction limit of ₹20,000, the cashback amount will be credited to your wallet on the first day on the following month.